The ultimativ professional window cleaner device. Cleans 2005 to 300 square foot without a water bucket. The world record device is modified for you! Now you will clean your windows faster than the professionals; cleaner than the pros; you can use 10 different positions with the Vario window device Easy use: 1. Hold the device with the fibre upwards. Wet it completely under the tap. 2. Roll 3 – 4 times with the Rollfix over the fibre. To make the Protective Formula foam, rub it in with your fingers. 3. Then by moving your hand across the fibre pad and pressing down, squeeze out the excess water so it dosen't drip when held it an angle. 4. Move with light pressure the fibre pad over the surface to be cleaned making circular motions. 5. By pushing on the button, adjust the device in a way that the rubber lip is at the top. Dry the edge of the rubber lip with a dry Star-Cloth. Starting at the top of the window, remove the water by pulling the rubber lip down the window applying light pressure and ensuring that the pad does not come into contact with the glass. 6. Press the fibre pad lightly against the glass at the bottom of the window and the fluid will be absorbed by the fibre pad. This prevents dripping on the window frame. 7. Before each application, dry the edge of the rubber lip with a dry Star-Cloth to prevent streaks. 8. When finished, rinse the fibre with your hands using clean water only. 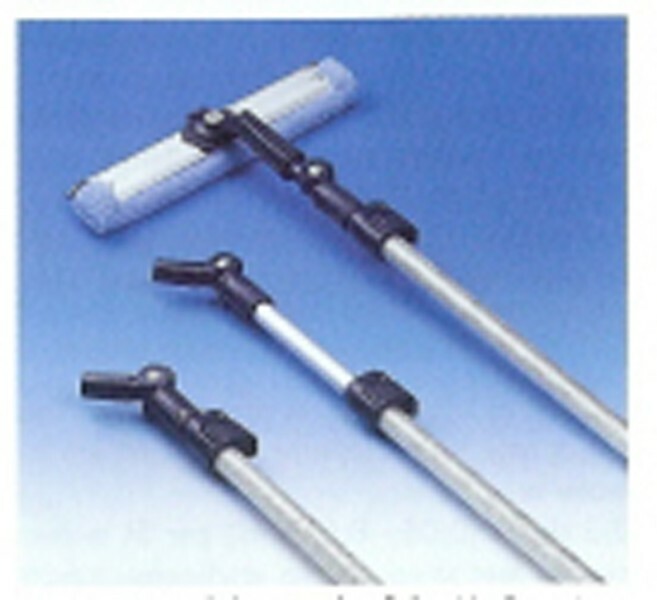 Use Telescope pole extention for reach high window, ceilings, walls, atriums, trucks and bus windows and many more.